The Python was first spotted by a member of the public in Kinlough Park “sunning herself on the side of a trail” in July. THE ISPCA IS looking for a special home for a Royal Python that came into its care during the summer after concerned residents spotted it in a park in Leitrim. After a few more sightings from concerned locals, the snake was captured with the assistance of local gardaí and wildlife rangers. 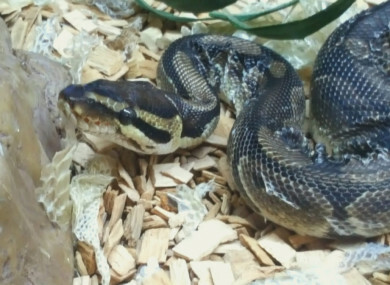 The rescuers who found her have named her Penelope and described her as “a social and friendly snake”. Royal Pythons, native to sub-Saharan Africa, can live for up to twenty years. The ISPCA said that it is unclear how Penelope came to be in the park but because no one has come forward with any information so far, she can be rehomed. Three-year-old Penelope has now fully recovered and according to the ISPCA is “ready to go to a special home where her new owner has the specialist knowledge and skills to provide proper care for her, for the rest of her life”. Kevin McGinley ISPCA Senior Inspector said that it is important that this python goes to an experienced reptile keeper. “We rescued a few snakes that were on the loose this summer and would like to remind the public that these reptiles make great escape artists. “Please make sure their enclosures are secure, and please don’t deliberately release them,” McGinley said in a statement. The ISPCA also stated that it is continuing to advocate for stricter controls over the sale and keeping of exotic species. Anyone who is interested in adopting Penelope can contact the ISPCA Donegal Animal Rehabilitation Centre on 074 91 52360. The ISPCA has stated that as Royal Pythons are solitary in the wild, they should not be kept with companions. The snake is non-venomous, and as a pet should be fed a diet of pre-killed mice and rats. Email “'Social and friendly': Penelope the Python is looking for a new home ”. Feedback on “'Social and friendly': Penelope the Python is looking for a new home ”.